Made like the "Mack-Belly" only with less "belly" to the shape. Kazan Squirrel hair and a brass ferrule. Mack-Lite Sword Pinstriping Brush series M-L size 0Mack-Lite Sword Pinstriping Brush series M-L size 0 by Mack Brush. is the pinstriping brush wit..
Mack-Lite Sword Pinstriping Brush series M-L size 00Mack-Lite Sword Pinstriping Brush series M-L size 00 by Mack Brush. is the pinstriping brush w..
Mack-Lite Sword Pinstriping Brush series M-L size 1Mack-Lite Sword Pinstriping Brush series M-L size 1 by Mack Brush. 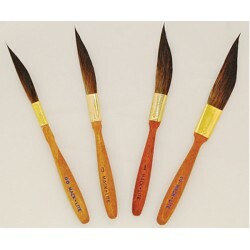 is the pinstriping brush wit..
Mack-Lite Sword Pinstriping Brush series M-L size 2Mack-Lite Sword Pinstriping Brush series M-L size 2 by Mack Brush. is the pinstriping brush wit..